Tennessee state policy allows students to earn dual credit for academic or CTE postsecondary courses taken at their high school, a postsecondary institution, or virtually. Public postsecondary institutions in the state are required to accept dual-enrollment credits (ECS, 2015). The Middle College National Consortium has partnered with institutions of higher education to provide two Early College High School programs as part of the Early College High School Initiative (ECHSI; Jobs for the Future, n.d.). Tennessee has adopted the National Career Clusters Framework and maintains programs of study that link secondary and postsecondary CTE programs across each of the 16 Career Clusters. 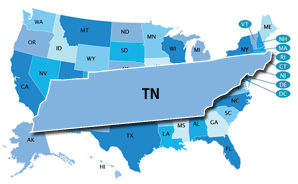 Tennessee does not have a statewide system for career exploration or career plans at the K–12 level. The Tennessee Department of Education website offers educators High School Early Warning Intervention Template Resources. These resources include Early Warning System Identifying Information Standards, an Early Warning System Customizable Example, an Early Warning Instruction Template Manual, and a Tutorial Video. The level at which Early Warning System data are reported is not publicly available. Educators can access the Early Warning System data.